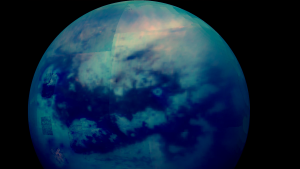 By analyzing data from NASA’s Cassini spacecraft’s last flyby in 2017, scientists found that Saturn’s largest moon Titan is covered with lakes similar to those found on Earth. Precipitation refills some of the lakes once they drain over time, just like on Earth, confirming a long-standing theory about the moon’s geology. But there’s one obvious difference from Earth: Titan’s lakes are filled with liquid hydrocarbons, including methane and ethane — very much unlike the fresh water found in Lake Michigan. The new information about deep, miles-across lakes provides important insight into the nature of Titan’s geology — and how its north pole compares to its southern hemisphere. “It is as if you looked down on the Earth’s North Pole and could see that North America had completely different geologic setting for bodies of liquid than Asia does,” Jonathan Lunine, co-author of the paper published in Nature Astronomy today, said in a statement. “This was Cassini’s last hurrah at Titan, and it really was a feat,” Lunine said in the statement.